4 course dinner with a bottle of wine and 2 glasses of Glass of Perrier-Jouët Blason Rosé, NV. €155.00 Per Couple. Indulge in Valentine's Dinner in the elegant atmosphere of the award-winning Seasons Restaurant featuring crisp white linens, candlelight and fresh roses. 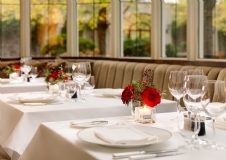 Our delicious Valentine's menu is prepared with love by our culinary experts which features the freshest Irish produce. Enjoy a true five-star Easter Escape in the leafy neighbourhood of Ballsbridge. From the moment of arrival you can relax and let us take care of everything. Three course lunch for €19 available Monday to Friday. Why not whisk the family away to the luxurious five star InterContinental Dublin in Ballsbridge on a family escape and enjoy lots treats from the moment you arrive.